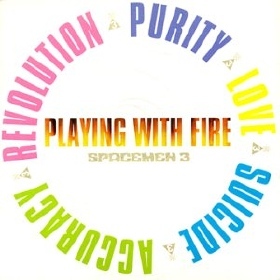 Spacemen 3 finally live up to the space rock potential of their name on their third album, Playing With Fire. Excepting some programmed sounding drums, the band basically drops all conventional rhythmic structure, building songs of of pulsing, delayed, and droning guitars and synths. Most of the album creates a dreamy pad for the songs to float on, although we do get the buzzsaw drones of "Revolution" and "Suicide" to break things up. At this point, the band was no longer projecting a united creative front, and it's clear that Sonic Boom and Jason Pierce were veering off in very different directions of psychedelia. Pierce's tracks like "Come Down Softly To My Soul" and "Lord Can Your Hear Me" are very dreamy, but seeped in old school R&B and surprisingly gospel. It's no coincidence that his later band would be dubbed Spiritualized, and the roots of that band are more than apparent here. Pierce's lyrics are surprisingly direct. Sonic Boom goes for a much colder sound, working with cycling drones and dispassionate, surreal vocals. Fortunately, on Playing With Fire these approaches compliment each other well and make the album all the better for it. Everything on the proper album is quite good. As much as I enjoy Pierce's gospel-psych (which he would majestically perfect in his later band), it's Boom's strange droning that really does it for me here. "How Does It Feel" in particular takes the sound world of the earlier "Ecstasy Symphony" and gives it a little more definition and shape. The lyrics are somewhat cliched, but Boom's distant, unattached vocal gives it a few more layers. It's easily one of my favorite Spacemen 3 tracks. "Revolution" and "Suicide" adds distortion to the drones and basically tries to pummel your brain into a trance state. Once again, "Revolution" includes some strange lyrics, with Boom desperately pleading that revolution "takes only five seconds." It doesn't make any sense, but he sounds damn serious about it. The opening track "Honey," is the only one that even tries to combine Pierce's and Boom's visions. With the vocals practically backshifting through time and an echoplexed sound, Boom's contribution is apparent. But unlike his other tracks on the album, Pierce's undercurrent of soul is also present. I guess they were playing nice that day (as they functioned mostly as bitter rivals by this point), and it resulted in one of the album's best tracks. This disc is probably not the best introduction to this band, the Perfect Prescription is still a better place to start. Once you've attuned yourself to the sonic sphere of Spacemen 3, you may find that Playing With Fire is the band at their very peak. The kind of recent reissue includes a plethora of live tracks, demos, and a couple of random tracks. There's a Pierce-led version of "May The Circle Be" unbroken that is fun. As a little note, the 4.25 Trip-O-Meter rating is basically averaging about 3.5 for Pierce's tracks along with the full 5 for Sonic Boom's tracks. The quality is obviously very high throughout. there's no more link. dr schluss has gone private i guess. if you're looking for Playing with fire check my blog.